We live (a) society. So we must learn how to live (b) — peace and amity (c) — others. We have to respect other’s rights and privileges and (d) — and (e) — as we expect others to respect us. We have (f) — lot of duties and responsibilities (g) — society. Education should aim (h) — making each individual fully aware (i) — these duties and responsibilities. it is true that one has to learn how to earn (j) — bread. (a) — sun is the nearest luminous body (b) — the earth. (c) — moon seems to (d) — light. this is not its own light, but light reflected (e) — the sun. A luminous body is one which (f) — light. The moon is not (g) — luminous body, nor are the other planets luminous, (h) — man standing on the moon will see the earth (i) — a bright body. But this is, of course, the light (j) — the sun. A proverb goes that a man without an aim is a ship without a rudder. Likewise, a man without an aim (a) — reach his goal. He (b) — in his way of life. So, everyman should (c) — a definite aim. But nothing is more difficult than the choice of profession. Students (d) — it very difficult to choose a suitable profession. Choosing profession becomes very difficult because there (e) — many paths and courses open to them. They should (f) — their aim according to the abilities they are (g) — with. All (h) — the same abilities and aptitude. Students may (i) — with their teachers who are able to (j) — their abilities. The stranger said to the boy, “Will you tell me the way to the nearest hotel?” “Yes, 1 will. Do you want a residential one in which you can spend the night?” said the boy. “I do not want to stay there but I only want a meal,” replied the man. (a) The; (b) from; (c) The; (d) have; (e) from; (f) emits/gives; (g) a; (h) A; (i) like/as; (j) of. (i) Once there was an honest and pious man named Abu Ben Adhem. (ii) One night he was in a peaceful sleep. (iii) Suddenly waking up he saw an angel. (iv) The angel was engaged in writing the names of the persons who loved God. 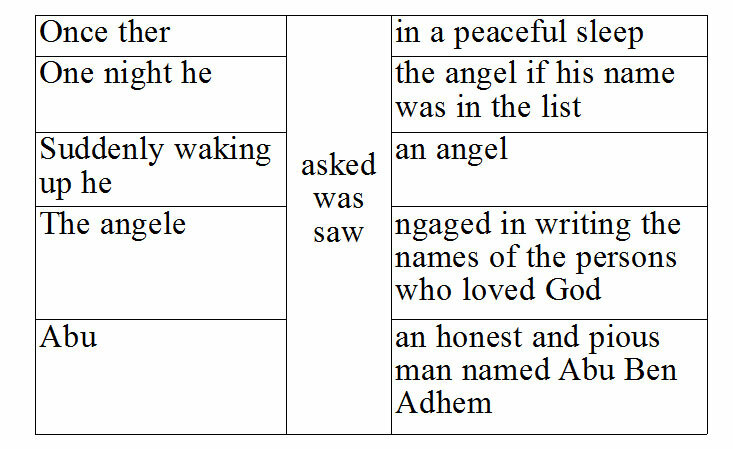 (v) Abu asked the angel if his name was in the list. (a) cannot; (b) stumbles; (c) have; (d) find; (e) are; (f) fix; (g) endowed; (h) have not/do not have; (i) consult; (j) evaluate. The stranger asked the boy if he would tell him the way to the nearest hotel. The boy replied in the affirmative and said that he would tell him and asked if he wanted a residential one in which he could spend the night. The man replied that he did not want to stay there but he only wanted a meal.